Used 2016 Ford F-150 XLT SuperCrew 5.5-ft. 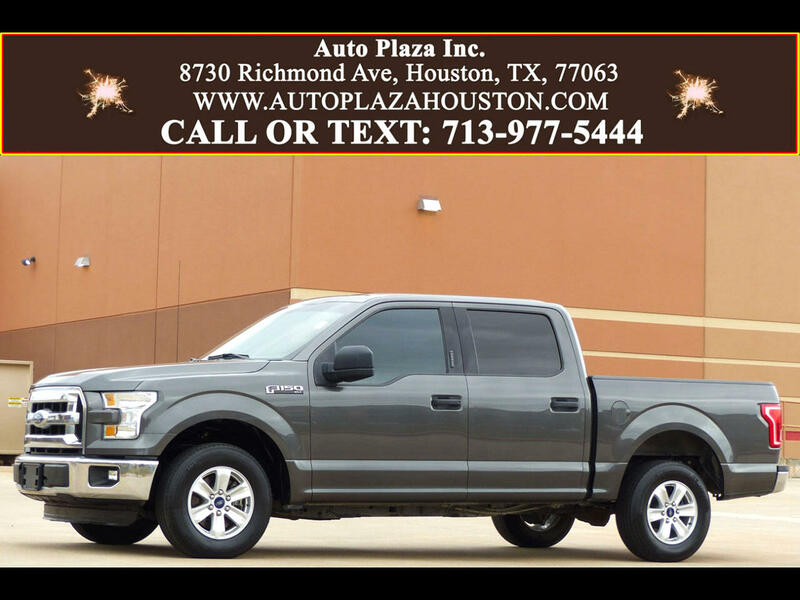 Bed 2WD for Sale in HOUSTON TX 77063 Auto Plaza, Inc.
You are looking at this Low Mileage 2016 Ford F150 XLT with a Slick 6 Speed Automatic Transmission and the Powerful 5.0L V8 Flexfuel Engine!! Options Include, 110V Power Outlet, XLT Chrome Appearance Package, 17" Aluminum Wheels, Keyless Entry, Remote Start, 7,000 Gvwr Package, 5.5 Ft Bed With Bedliner, Tailgate Step, Voice Activated System, Bluetooth, CD/MP3 Player, AUX/USB PORTS, XM Radio, Power Leather Seats, 3.55 Rear Axle, Power Pedals, Fog Lights, Power Sliding Rear Window, Running Boards, Trailer Tow Package, Trailer Sway Control, Audio/ Cruise and Temp Controls on Steering Wheel, Locking Removable Tailgate, 4-Wheel Disc Brakes with ABS, AdvanceTrac with Roll Stability Control, Automatic Climate Control, Tire Pressure Monitor, Power Windows, Power Locks, Dual Front Air Bags, and Much More! This 2016 Ford F150 in general gives you a Safe and Pleasant Ride and Makes for a GREAT Work Truck!!!! So CALL NOW!!! This Truck Won't Hang Around!! !